If you would like to learn more about self-injury, how best to respond to friends and family who may be self-injuring, including advice on reducing or stopping, then please come to our workshop on 25 March, 15:00-16:30. Contact Staff Counselling for more information: phone 02920 879572 or email staffcounselling@cardiff.ac.uk. By Kyla Shields, Associate Counsellor, Staff Counselling. The fact that you have read this far gladdens my heart! You haven’t been immediately scared off by those frightening, emotive, stigma ridden words……SELF-INJURY. So, I commend you for your bravery and thank you for your attention. I hope that what I have to say will enlighten and assist you in understanding this surprisingly common phenomenon, whether you are a person who engages in self-injuring behaviours, a relative or friend of someone who does, or a wellbeing, mental health professional – or similar – hoping to gain a clearer understanding. Self-injury can be difficult to understand or accept. It taps into our fear about acceptable and unacceptable behaviour; a fear that “Anarchy will reign if we don’t put on a brave face, if we don’t control our emotions, if we don’t have a stiff upper lip!” Well guess what? The inability to express and articulate our sadness, fear, rage or disgust allows anarchy to do just that. Except that it reigns within the confines of our own minds, wreaking havoc until it finds a way to escape and let itself be known. And sometimes the only way it can find expression is through the physical harming of one’s own body. These emotions find a voice, and it’s a voice that finds comfort through harm. 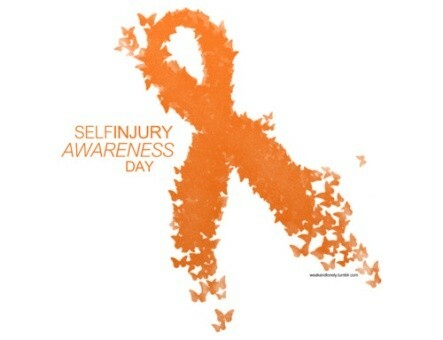 The paradox of self-injury demonstrates how a dangerous and harmful activity has the potential to save life. Understanding this can be the first step in understanding self-injury. Harming one’s body can be used as a coping mechanism, allowing the release of unmanageable emotional pain that is too difficult to verbalise or understand at any logical level. It can communicate extreme distress and aid in the quieting of inner turmoil and ‘noise’. It can bring back a sense of control when life feels overwhelming. Self-injury may be destructive, but under these conditions it works. Understanding the importance of self-injury to an individual as a survival technique helps to illustrate how stopping or reducing self-injury can be a frightening and devastating prospect. You could liken it to removing a safety net; something familiar; something controllable in a world that is unpredictable and downright scary. Any road to recovery can only begin with a willingness to make a decision to stop or reduce that comes from the individual and no-one else. For those who witness loved ones battling with self-injury, feelings can range from fear to anger, from helplessness to revulsion, from sadness to guilt. The temptation to beg, demand or cajole your loved one to stop is a difficult one to resist. But please remember, self-injury has been their companion through the darkest of times and possibly the only thing between them and suicide. Self-injury as a coping mechanism needs to be respected for that even though the safe removal or reduction of the behaviour remains the ultimate goal. But that goal can only be achieved at an individual pace, in an individual way that is controlled and managed by the one who is suffering. They are the experts on their own experience which makes them the experts in defining what works for them. Trust them…they’ll work it out with your love and patience. Further information can also be found on Mind’s website.